This series creates a dreamy fabric both dense yet soft by blending Peruvian Wool and Alpaca. By pairing a simple stitch with a delicate yarn, this series appears both elegant and functional, much like early Celtic outer wear. 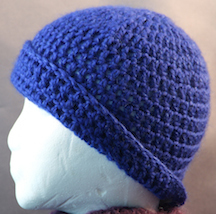 Feather light, these hats add class to a winter outfit, compatible with black, camel, hunter green, and navy. 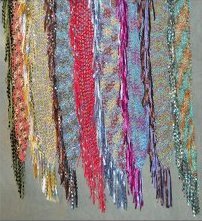 Hand-dyed silk/mohair blend creates an elegant effect of variegated colors in this ribbon-fringed accessory. 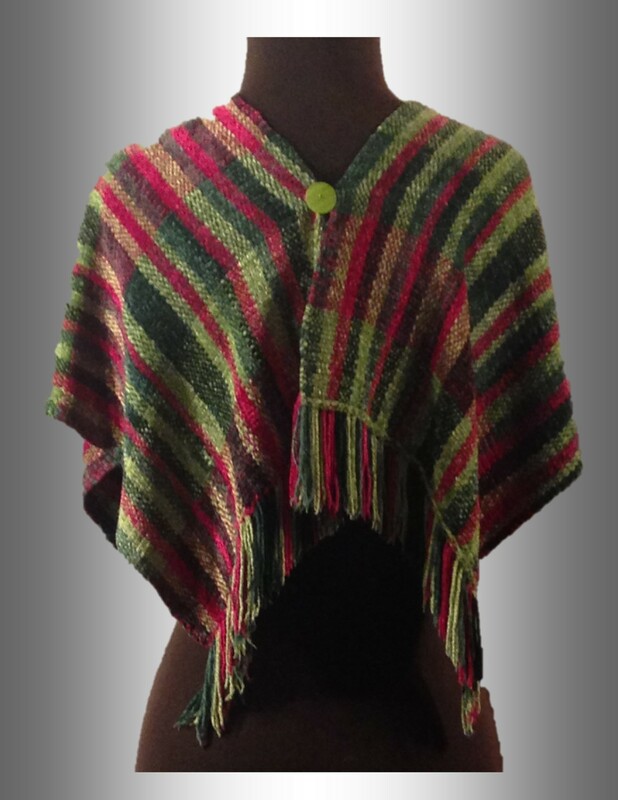 This versatile piece may be worn in three styles: Pointed (buttoned on shoulder with point in front), Looped (buttoned on shoulder in loose fold), or Draped (over both shoulders). 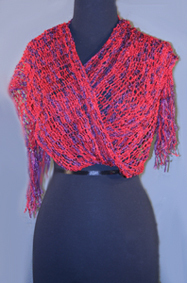 The Ribboned Stole design reflects the ancient, colorful mantles with delicate folds worn by the early Celts. 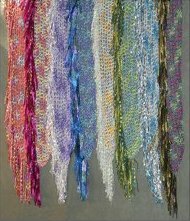 Festive ribbons parallel the Celtic love for life and frivolity! Available only at retail shows. 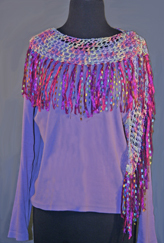 Surround yourself in luxurious warmth in a soft, color-filled shawl! 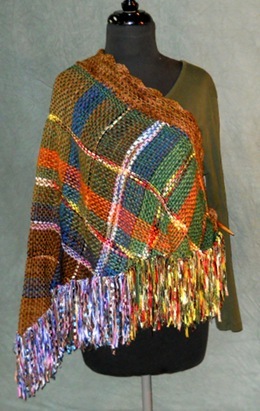 Each shawl is woven strand by strand with attention to color transitions and texturing with ribbons. Both are the same size, differing only in fiber content. Available only at retail shows or special orders. 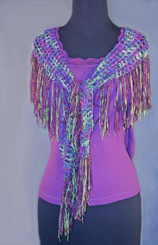 A classic style for all occasions, this luxurious Chenille scarf can be worn in a mobius, infinity style flip with button and fringe hanging flat behind the shoulders. 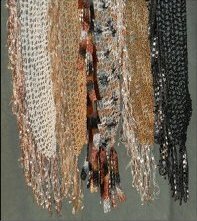 The elegant drape adds both sophisticated style and warmth in soothing color blends. 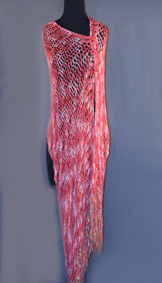 By undoing the button, the scarf opens in a lovely 60" piece which may be worn in traditional patterns. 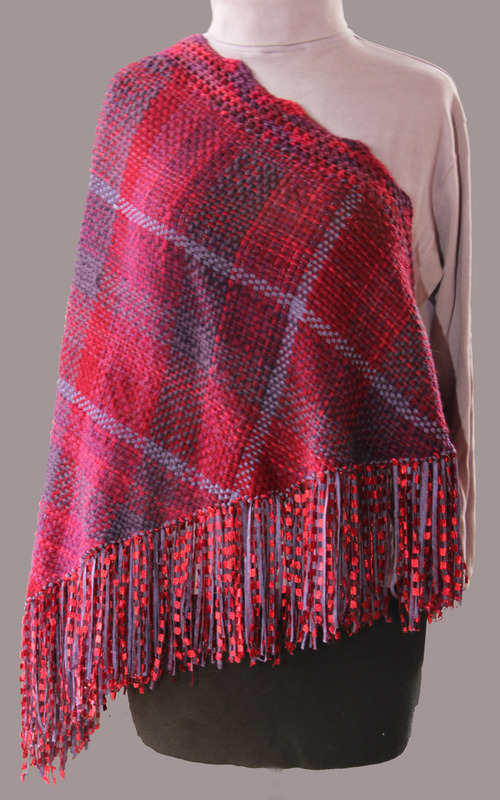 Wrap yourself in Scottish delight with this cozy and exquisite tartan shawl. 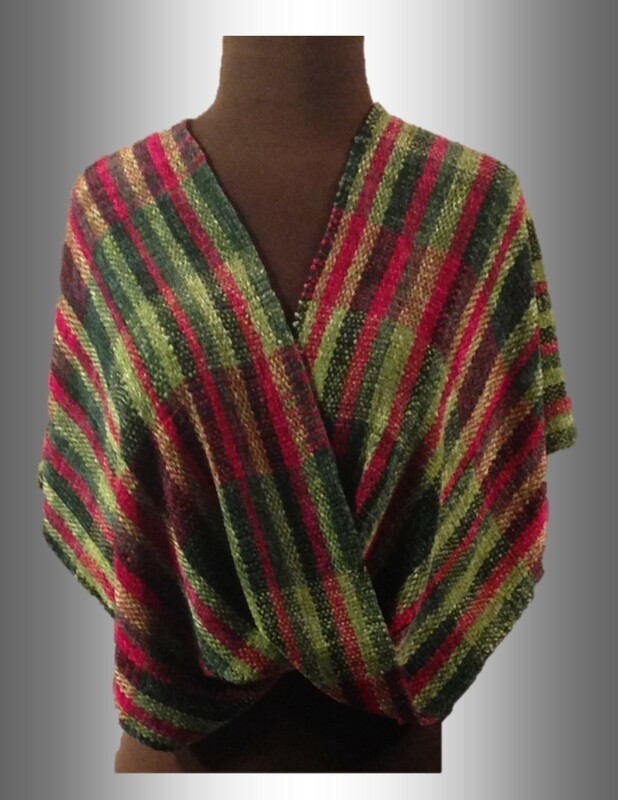 Handwoven on a triangular loom, this shawl expands the tartan set, creating dramatic stripes and color blocks. 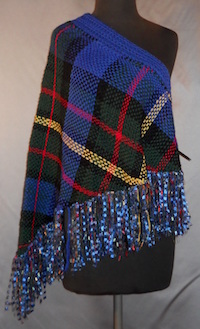 Due to tartan variations within each family, please call Bobbie at 828-689-4295 to confirm design when ordering. 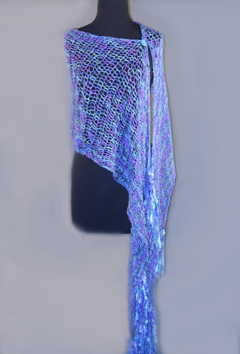 Hand-dyed rayon boucle with natural colorings make this scarf a faerie favorite! 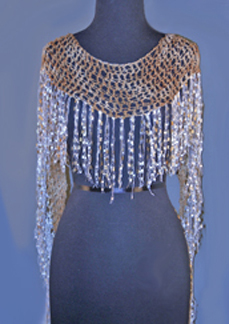 This elegant piece allows the wearer to reveal her regal inner goddess or playful inner child as the fringe dances with light. Color blends are chosen seasonally for fall/winter and spring/summer, yet the fabric is light-weight enough to be worn year ‘round. Its stylish appearance and luxurious colors are simply magical! Standard shipping is $5.00/item via USPS and will be added to your order at checkout.